Sometime after I wrote the first part of Something Of Value I read David Bakan’s Freud And The Jewish Mystical Tradition. Bakan’s book confirmed my findings while developing Freud’s relationship to his culture’s mystical tradition based on Bakan’s understanding of the Zohar and the Jewish Kabbalah that I haven’t read or studied, nor do I intend to unless I exhaust other pursuits which doesn’t seem likely. You never know though. However a point to consider is how Jewish is the Jewish mystical tradition, that is, what are its roots? Are they rooted in Judaism or elsewhere? Bakan seems to believe that the Jewish Kabbalah is derived entirely from Jewish sources independent of the general milieu. I don’t believe this to be true. The Jewish mystical tradition like all others is based on the very ancient Egyptian. Bakan believes that the Kabbalah arose in the first century AD. This is probably true. The Hermetic tradition which is equivalent to a European Kabbalah took form as such in Alexandria during the Ptolemaic period when Greek and Egyptian ideas interreacted. Hermiticism evolved from much earlier doctrines centered around the Egyptian god Thoth. The Zohar and Kabbalah then is Hermetic material adapted for Jewish needs. The whole can be traced back to Alexandria. The Zohar, or primary mystical book, which is attributed to the first and second century Rabbi, Simeon Ben Yohai, was rewritten, edited and whatever in twelfth century Spain by Moses de Leon reaching the Middle East after the expulsion of the Jews from Spain in the sixteenth century. Its influence then was transmitted to the seventeenth century messiah, Sabbatai Zevi. According to Mr. Bakan Freud was familiar with the Zohar and Kabbalah. I couldn’t go so far as to claim so myself but Mr. Bakan can quote chapter and verse. While Freud claimed to be scientific Mr. Bakan relates almost all of Freud’s psychology to the Kabbalah showing Freud’s dependence on Sabbatianism and Frankism as I indicated in Something Of Value Part I. Thus while seeming to be working from a scientific point of view Freud is actually blending a bit of scientific approach acquired from European sources, as there is no science in Jewish culture, with his Jewish religious material to subvert the European moral order. 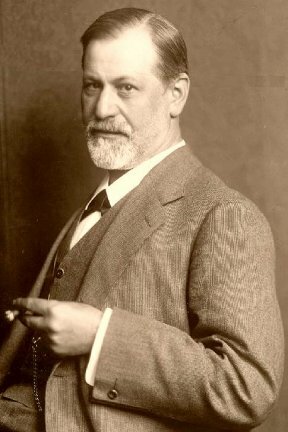 While Freud himself was at war with European civilization the international Jewish organizations extended his field of operations to the United States and Canada. Thus while Freud speaks specifically of Europe he can be taken to mean Euroamerica. A further background for his psychology, Freud’s central childhood fixation, appears to be the incident in which a European knocked his father’s hat into the gutter which his father meekly, or wisely, depending on your point of view, accepted without a demur. Because of this story Freud wished to avenge himself on Europeans. Probably at this point Freud assumed the Moses complex that stayed with him to the end of his life. He, Freud, would lead his people to triumph over the Europeans as Moses had led the People out of Egypt while Pharaoh and his army were drowned in the Red Sea. …that my ‘primary originator’ [of neuroses] was an ugly, elderly, but clever woman who told me a great deal about God and hell, and gave me a high opinion of my own capacities. On October 15, 1897, he quotes his mother about the old nurse who took care of him when he was very young. “Of course,” she said “an elderly woman, very shrewd indeed. She was always taking you to church. When you came home you used to preach, and tell us about how God conducted his affairs." His memory had become confused while it does not appear that he ever exorcised his fixation, for fixation this is. He apparently loved this nurse at the time rather than hated her. When she was later accused and convicted of stealing from the Freuds being dishonored and actually sent to jail, Freud was heartbroken while changing his opinion of her. But, he had had contact with Christian Europeans which left a lasting impression on him that he could not consciously recognize or acknowledge. If I am correct, this impression resurfaced when he came into contact with C.G. Jung who he adopted as a surrogate for this nurse transferring his love and hatred for her to Jung. Just as he loved this nurse there were apparently strong homosexual overtones in his relationship toward Jung. As Freud would have known, the compulsion toward repitition would have been a component in his relationship with Jung as with his nurse although he apparently did not recognize this. So much for his self-analysis. He found reasons to break off with Jung or drive him away while bitterly claiming to be betrayed by Jung just as his nurse had been accused and convicted of theft thus betraying the child Freud. Thus once again his contact with a Christian European was brief ending in sorrow for himself. A third situation occurred late in life when he wrote Moses And Monotheism. Rather startlingly he claimed that Moses was not Jewish but was an ethnic Egyptian. This means Freud, who had a Mosaic fixation, split his personality between his Christian longings and his professed Jewish identity. Another result would be that monotheism was not a Jewish invention but actually a goyish invention so that all the evil arising from monotheism was not the fault of the Jews but the goys. They had no one to blame but themselves. Thus Freud's notion of Moses may have been a sort of dream reversal of the facts. Whatever the results of Freud's self-analysis back before the turn of the century it is quite clear that he was unable to resolve his fixations nor, one believes, was he aware of their influence on him. He never integrated his personality remaining under the influence of his subconscious fixations. No wonder he ignored the conscious mind. Like most people Freud had to find his way from adolescence to adulthood and his true ambitions by a circuitous route. In the ‘Postscript’ which Freud added in 1935 to his Autobiographical Study he remarked that a ’significant change’ had come about in his writings during the previous decade. “My interest,” he explained, “after making a long detour through the natural sciences, medicine, and psychotherapy, returned to the cultural problems which fascinated me long before, when I was a youth scarcely old enough for thinking. He undoubtedly refers to his experiences in church with his Christian nurse contrasted with the 'Christian' who knocked his father's hat into the gutter. As Freud is very duplicitous in his use of language one should try to be very sensitive to the meanings behind the obvious meanings of his words. Thus I believe his use of the term ‘cultural problems’ can usually be understood as his inner conflict between his Christianity and Judaism. As Bakan points out, that while Freud rejected Rabbinical religious Judaism he was deeply immersed in the Jewish mystical tradition of the Zohar and Kabbalah. Thus one can discount his claim to be an 'atheistic' Jew. Or atheism has a more specific meaning for him. Bakan points out that Freud transited from the role of physician to that of ‘healer.’ That is analogous to the hands on approach of Christian Fundamentalism. Freud then for all practical purposes abandoned medicine for healing. Then, sometime between 1913 and 1915 he abandoned psychoanalytical research for his ‘cultural’ studies. In other words, he began to apply his psychological studies to the manipulation of cultures through his developing ideas on Group Pschology. Just as Freud learned that there were screen memories that transformed more painful memories into something more acceptable to salve those injured feelings so Freud learned that he could develop ’screen’ language to serve up unpalatable meanings in palatable ways. Thus what he says has a reasonable meaning to the uninitiated but has a totally different meaning to the initiated- those with the key. In many ways it is the same as a criminal argot. Those who understand the argot can discuss topics openly while only those with the key can twig it. Ya dig? The key incident that fixed his mind on ‘cultural interests’ was his father’s story of the guy who knocked his hat into the gutter. Freud then, in attempting to disguise his hatred for ‘Christianity’, while secretly admiring it because of his nurse, and his desire to avenge his father and hence, all Jews, through his Moses fixation developed his program. Thus he acting in his own mind altruistically and need feel no guilt. Freud was very seriously conflicted, also suffering from depression according to Bakan. Hence his purpose was to knock the whole of European Christianity into the gutter, which is to say the actual persons of Europe. Now, this obsession and extreme form of vengeance for something that, after all, didn’t happen to him nor did he witness it, might certainly be considered a neurosis, probably a psychosis and possibly a degree of insanity. In reading Bakan there is a hint that he believes Freud had a disordered mind. Indeed, Lang’s Testament Of Dr. Mabuse should be held steadily in mind when reading of Freud’s later career. Lang must have had Freud in mind when he filmed Mabuse. Lang's departure from the denouement of the Cabinet Of Dr. Caligari ended on the conventional note of the victim, or whistle blower, being declared insane. Lang reversed this by making the perpetrator, Caligari/Mabuse insane as in real life with Freud. Further the disciple of Mabuse, the head of the asylum, Dr. Baum was also declared insane. Although the problem appears to be solved the threat of the conspiracy continuing from the cell now occupied by Dr. Baum looms like a spectre over the ending. While Freud was never incarcerated as he should have been, he was imprisoned in his mind no less than Drs. Mabuse and Baum or the character in Gradiva. It is interesting that Freud had a plaster cast of the relief on which the story of Gradiva was based that he displayed prominently in his office. The story obviously had greater significance for him than his ‘objective’ analysis of the story would lead one to suspect. Thus from 1915 to 1935 like Dr. Mabuse he sat imprisoned in his projection of reality churning out page after page, volume after volume of criminal plans for the subversion of civilization which is to say of Euroamerican civilization but not Jewish culture. He makes a definite point of that illusion of whose future he is discussing applies only to Europe and Christianity rather than religion in general which would include his own Judaism. At this point he is not aware of the burgeoning Wahabi Moslemism so that his message is that Jewish beliefs are real while Christian beliefs and Scientific reality are illusory. One has to penetrate the screen language and convert it into the proper psychological intent. As David Bakan points out Freud lived his whole life in a sort of Jewish ghetto having very little contact with Europeans. His choice of Jung as the potential heir to his ‘creation’ may have had as much to do with a desperate attempt to reestablish a connection similar to that of his childhood Christian nurse. Thus his overtures to Jung while under extreme stress were driven from his unconscious while he himself was unaware of his true motivations. This would have been an expression of a repetition compulsion. Thus as his nurse disappeared from his life under discreditable circumstances he replicated the situation in Jung. His attempt to convert Moses (hence himself) into an Egyptian may have been a last attempt to replicate and resolve this early contact with Christianity. His view of European civilization then was filtered wholly through a Jewish projection of possibilities. He really had no intimate knowledge of European mores. From 1915 on, then, his writings were obsessed with hatred for Euroamericans and a desire to wreak vengeance on them by destroying the basis of their civilization. His ideas for the subversion of European civilization were carried to America by the international B’nai B’rith organization to be adopted and employed there. In addition Revolutionary plans executed in Europe in 1917 were financed and organized by the world Jewish government in the US. While functioning according to local conditions the Revolution was conducted an an international scale. Act locally, think globally. Hence Jewish revolutionaries left the US for Russia after 1918 to aid in the consolidation going on there. This is really an incredible if repressed story in the Freudian cultural manner. Very Freudian that such phenomenal criminal activity that were best left invisible was repressed into humanity’s unconscious. At this point I think it might be well to examine Freud’s vision of the unconscious in more detail. While there can be little doubt that there is a subconscious function to the human mind usually referred to as the unconscious after Freud that had been an accepted fact amongst scientific researchers for a hundred years. The exact nature had not been determined nor does Freud determine it. His view is merely a projection of his own conscious and subconscious needs. Certainly not in the literal sense but in the figurative sense that Freud would do anything, abandon any moral precepts, to achieve fame. Bakan points out the superscription to Freud’s ‘Interpretation Of Dreams’ quote from Virgil: Flectere si nesqueo superos, Acheronta movebo. Translated as: If the gods above are no use to me, then I’ll move all hell. Freud further blurred the line between good and evil or amalgamated the two from the influence of Sabbatai Zevi and Jacob Frank who cast off all morality. Since Freud has been successful in altering both Euroamerican and Jewish morality toward these immoral or amoral beliefs by false ‘Satinic’ criminal doctrines it is imperative to debunk his personal projection of the subconscious. As he ‘made a pact’ with powers below - the unconscious - against the powers above - the conscious - he invested his projection of the unconscious with the attributes of ‘Satan’ or evil. This view of the subconscious is a self-serving fiction not based on any science. He sets up the unconscious as an autonomous entity with the main function of blighting the conscious. He give the powers of hell supremacy over the powers of heaven. This notion is mere fantasy; it cannot be. There is no possibility that the function of the subonscious doesn’t have a positive function in and of itself and in relation to the conscious. If you actually think about it for a moment you will realize this must be true; every part of the body works to the benefit of the whole; there can be no exception for the subconscious. Now, Nature is not flawless. The order that the religious seem to find is not there. Nature functions in a much more haphazard way. It takes only one peek through the Hubble to see that. However the relationship between the conscious and subconscious is delicate and easily disrupted especially in the early years of the organism when it has no experience with which to evaluate the events occurring to it. The Ego and Anima are not part of the subconscious and possibly not of the conscious but function through the conscious and unconscious minds. The conscious mind perceives phenomena and acts on them but the terrific inflow of impressions is more than it can deal with so the day’s input is received into the subconscious for further reference. Thus a major function of dreams in the sleeping state is to review and process, organize the information into a coherent whole for future reference. The subconscious then is able to compare incoming information with experience for response. When the conscious and subconscious minds are attuned, that is to say the personality is integrated, the system works properly, otherwise the response is distorted by one’s fixations. This is very easy to see in Freud. However, especially in youth when experience is scant, the mind may be challenged with some devastating new experience for which there are no reference points. If an appropriate response is made there is no problem. If an inappropriate response is made against which future experience is in variance, the earlier resp0nse which has become fixated will over rule an attempt at an appropriate response and substitute the fixated inappropriate response. Thus the current response will constellate around these earlier fixations which gives one bizarre symbolic dreams and inappropriate responses. The inappropriate response will usally result from an insult to the Ego or, in other words, the Sexual Identity. In turn the response to this insult will be expressed in a sexual affect. The purpose of psychoanalysis, which is real science, although Freud didn’t see that, is to locate and exorcize them allowing the conscious and subconscious aspects of the mind to function properly as a unit. Dreams are actually important because they are an analysis of life’s experence providing responses. None of this, of course takes in intelligence, discipline and other functions of mind and character that Freud dismisses as irrelevant. Now, in the cultural war between Judaism and Euroamerica, or as Jews express it, Christianity, Freud infused the Jewish subconscious with a disregard for morality a la Jacob Frank in relation to Sabbatai Zevi. Any evil was excused so long as it seemed to advance the cultural war. While this infusion may not have reached down throught the ranks of Jewry- which is to say they behaved in a certain way but didn’t know why - the ideas were thoroughly planted in the minds of what Henry Ford would call the international Jew. The cold war between Jews and Europeans became a shooting war in the wake of the Great War. Men, money and munitions flowed in a wide steady stream from the United States to Russia. Coordinators established themselves in strategic locations. If one reads restricted, censored literature the impression is made that horrible anti-Semites harassed and hated innocent unresisting Jews. Jews may have been killed but they were not innocent and unresisting. To the contrary freed from guilt, or supposedly so, by Freudian/Sabbatian/Frankist precepts, abattoirs were established throughout Russia where unsuspecting Russians were led in one door and flowed out the other in liquid form. This is not the place to dwell on gruesome details. The literature exists but the collective Jewish mind has repressed the deeds into the collective unconscious. In other words, history has been denied and censored so that the crimes can’t be known. Actually Whittaker Chambers, the Red spy, translated a number of these books concerning the Hungarian atrocities of Bela Kun and Tibor Szmuelly, but those are impossible to come by. All this slaughter was made possible and justified by the doctrines of Freud. In relation to the 1919 atrocities of the Jews in Hungary and the response which expelled them from power it should be noted that Israeli troops were recently introduced into Hungary to reestablish the tyranny of Kun and Szmuelly. Don’t ever think the historical memories are short. Freud sat comfortably in Vienna looking on as the carnage occurred. If, as believed, the tenor of his writing changed in 1925 that was probably due to the death of Lenin in 1924. By 1925 it was apparent that the Jewish Revolution was on shaky grounds as Stalin began his rise to power so that Freud may have renewed his cultural attack or, on the other hand, as 1928 was the terminal projected year of the Jewish Revolution Freud may have been celebrating the death of European Civilization when he published The Future Of An Illusion. By the illusion he meant European Christianity and he meant European civilization was finished. The Rome of the Popes would have fallen. In Illusion and Civilization And Its Discontents Freud makes us believe that the malcontents of civilization are synonymous with civilization rather than being a minority that always exists during great revolutionary changes. Freud whose Judaism was challenged by the Scientific Revolution as much as Christianity or Moslemism must have been aware of the reactionary ‘instinct’ as he himself was in reaction to both European Christianity and the Scientific Revolution. …under the ruse of “playing the devil” (Freud) served Sabbatian interests. In this respect, however, just as Freud may be regarded as having infused Kabbalah into science, so may he be regarded as having incorporated science into Kabbalah. Sabbatian-wise, by closing the gap between Jewish culture and Western Enlightenment he acts as the Messiah nor only for Jewish culture but for Western culture as well. Note that Western Enlightenment is reduced to Western culture putting it on a par with Jewish culture which is a tacit admission that there is no science in Jewish culture and none is wanted in Western culture. Language as a screen. Bakan’s is a hefty statement. Under the guise of the Devil Freud becomes the Messiah not only for Jews but for Euroamericans. Truly in this scenario good comes from evil, assuming that the Messiah is good. In case you missed it, Freud according to Bakan was the Second Coming. Narrowing the gap between the two cultures means the imposition of Jewish culture as the Chosen or Abelite people over Western or Cainite culture. Thus the age old goal of reversing the Cain and Abel story so that Cain is obligated to give preference to Abel is accomplished. By infusing Kabbalah into science, science has been subjugated to the unscientific Jewish culture so that the Catholic/Jewish situation of Medieval Europe has been restored. The Enlightenment that invalidated Judaism, Christianity and Moslemism has been obliterated, hence the revival of religion happening today. Thus in Bakan’s eyes and according to Freud’s intent Judaism has deconstructed Euroamerican society so the reconstruction according to Jewish cultural mores can commence. The result has been accomplished by the destruction of the Scientific Consciousness as there is little of science in Freud’s cultural writings. He just says what he believes and wants you to believe and asserts it as fact. As always there were some Westerners who resented the encroachment of the strict limits of science. Rider Haggard in his Allan Quatermain made that as clear as possible. The topic is the dominant theme of Edgar Rice Burroughs’ Tarzan novels. Henry Ford and his mass production methods was a symbol of that rebellion against the strict limits set by the clock. Some denounced it as Taylorism; but with each passing decade the West became more acclimated to the change as the reactionary mood became acclimated to the new reality. Freud invents ‘instincts’ and their ‘renunciation’ to give sense to his arguments; the ‘renunciation of instincts’ almost sounds scientific but it isn’t. There are no instincts nor does Freud even attempt to demonstrate their existence. Like the rest of Freud’s psychology the notion is just something Freud made up. As always he notes only the negative societal destructive effects. He says nothing of the ‘instinct’ to be around people which would conflict with his instinct against civilization- the last is a vague enough term the way he uses it. But, as Lang points out the hypnotic spell cast by Mabuse negates criticism so that the head psychologist, the objective scientist himself, Baum, suspends critical judgment falling under the spell to the point of becoming a disciple just as Lang himself did. Indeed, as the West has. Hitler was a blessing in disguise for the Jewish Revolution. The guilt caused by Hitler completely disarmed the West allowing the Reconstruction of Western mores to proceed at a faster pace than would have been possible without Hitler. Indeed, the Nazi Era drove the entire pyschotic Jewish Revolution to the shores of the United States beginning in the early thirties. Thus the deconstruction of Edgar Rice Burroughs’ America was assured. 5. The Byss and the Abyss 6. Freud & His Unconscious 7. Lad and the Lion . or by Edgar Rice Burroughs, Inc.